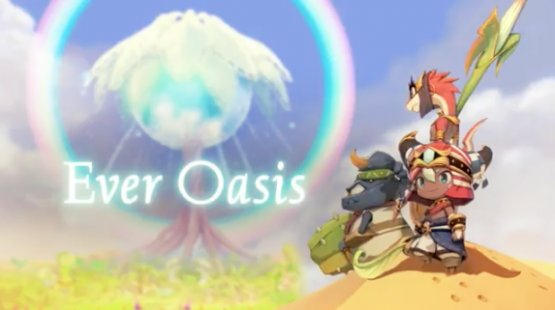 From the guy behind Moogle designs (that's all I got while I was trying to think of puns for the title), a game in which you cultivate (they love that word) your desert town, with shops, treehouses, and penguin-things; then go forth to smash s**t up and look adorable while doing it. It looks N64 as all heck (maybe early GC), but it's a cute-looking JRPG with shades of Fantasy Life, Animal Crossing, and maybe even Monster Hunter. I'll probably be getting it, because it's a JRPG and I love that stuff. Certainly looks cute and interesting, but not sending me into a supernova. It's a good reward for Grezzo, who've done lots of sterling work on Zelda to be able to strike out on their own (as it were). I look forward to seeing how it progresses. "Winner of the One Billionth JRPG on 3DS Award". Now I've had a proper look at the gameplay trailer - hereabouts - I'm much more up for it than before. It looks like Crystal Chronicles had a baby with Zelda, which means it's a massively exciting thing if you're me. Roll on 2017! This was a pleasant surprise! There was a lot more Zeldaesque puzzling than I expected when I first read about this. One to watch, I feel. I'm quite curious myself. Mind you, I've also seen (and assumed) some comparisons with Fantasy Life. I hope not, as, although that was clearly an ace game, I found myself wandering around doing who-knows-what-and-for-what-reason. But this looks like there's a bit more thought in individual pieces. Quietly optimistic. Except the quiet part. A demo version of this dropped onto the eShop yesterday and I'm fresh from beating it. My early Crystal Chronicles/Zelda impressions now have to have Monster Hunter, Lost Vikings and Sim City added to them: you head out to scavenge with a small party whose differing skills combine to help you progress in dungeons so you can bring back loot to keep your residents happy. The only sour-ish note I found was that the overworld seemed a bit empty (it is a desert, mind). In short, enthusiasm undimmed. If this had released a coupleof years ago I'd have been all over it. As is, I don't want to tie myself to playing a big ol' RPG on my 3DS just now. I'll check out the demo - I had a good ol' time with Echoes and I wouldn't mind something new to play on 3DS. I'm not only up for this, I'm more up for it than I am ARMS. Pleased to see I won't be lonely in the oasis ever. I sort of pre-ordered it yesterday - the fellow at GAME said it was a bit too close to release to truly guarantee getting the game. If it doesn't arrive, there'll at least be more time to pile through DQVII. Got it (last copy in the local GAME), tried it, played the tutorial, switched it off soon after getting blasted out of dodge. It looks cute enough but already feels clunky. We shall see. Got the one and only copy at my local GAME, but am determined to beat DQVII first. Its time is next. This has me properly intrigued after reading that its combat was almost MonHanesque. Colour me interested! It's really colourful, is my first impression. Also: adorable. Apart from the lack of any text sound effect at all, which is kind of creepy. But mostly adorable. Look at that water spirit! And that fat bird thing! They're all so happy! I even brought it to where I live in the week while leaving the Switch behind! Did a dungeon. It's still cute and fun, although I can already see some potential annoyances. But on we go! DoPo: I'm into this. I see this as being the next game I enthuse about while everybody else looks on in bewilderment, joining Bravely Second and Meteos. High praise. It's just so sweet, so colourful. It's the antithesis of BBoP gaming, where the stereotype (rightly or wrongly) is sweaty white men with guns. Your hero is a kid who can be male or female and any colour you choose, and is by default brown, which makes sense because they (a) live in the desert and and (b) are a seed. They have a sword. They don't sweat. They sort of level up, but that's by-the-by. More important is levelling up the oasis, and charging across the desert. It's easy. And I can see parts of the basic gameplay loop potentially getting dull. But I'm growing armour out of a tree, so who cares? Oh, and the night-time music in the oasis is one of the loveliest things ever. It's really deserty, but at the same time beautiful. A microcosm of the game, then. I will join you in the desert as soon as I wallop DQVII. Given that my exam marking has just landed, this may take some time. Well I've taken down the first boss! It was the one shown in Treehouse a year ago, and it wasn't terribly hard, but I enjoyed myself. I've taken my first tentative steps in the game and I have two thoughts so far. 1) The game is so pleased when you achieve something! I haven't been praised this much for a very long time. 2) Perhaps linked to the above, everything is so charming. The last game that was this charming from the off was Little King's Story; hopefully EO won't be as tough.